It’s a truism that without industry capability, there can be no defence capability. Getting acquisition/industry policy right is therefore essential to getting defence policy right. As the Australian Government prepares to deliver a new Defence White Paper—and the associated Defence Capability Plan and Defence Industry Policy Statement—a simple, clear framework is needed to guide its thinking about acquisition and industry policy. The need to obtain the ‘best bang for buck’, i.e. maximising cost effectiveness not just in relation to initial major system acquisition cost but also whole-of-life, whole-of-capability costs. The need to ensure industry capabilities needed for defence self-reliance are available in-country. 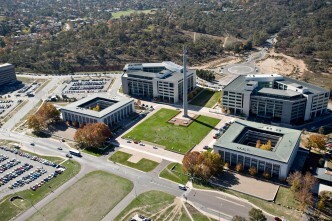 To achieve, where possible, a net benefit for the Australian economy, perhaps by spending a little more to develop/acquire/sustain a capability in-country to provide a net positive outcome for the economy, taking into account the multiplier effect such an investment may provide but also the opportunity cost of any premium paid on the defence budget and overall Australian economy. Taken together, these three considerations lead to seven possible cases, depending on the capability being considered (Figure 1). While all considerations apply in all decisions there would clearly need to be a very strong case to overcome the ‘best bang for buck’ argument, given the need to maximise defence capability within funding available. 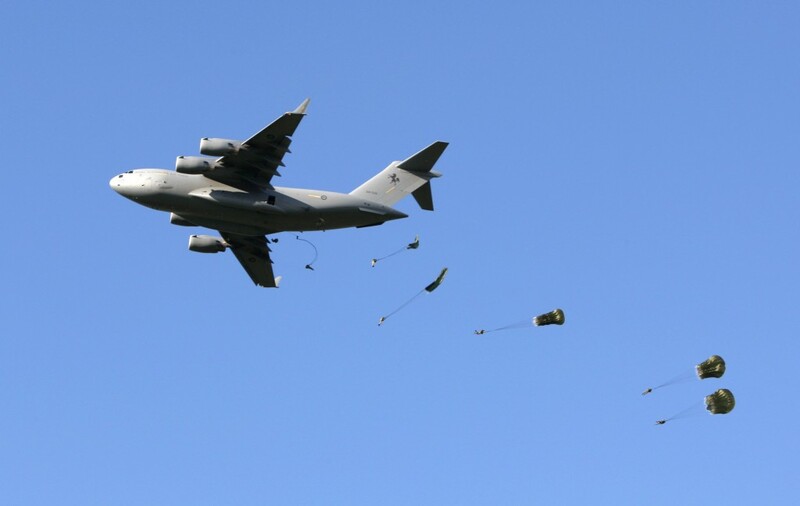 Case A – a capability that provides the ‘best bang for buck’ is ‘needed for Defence self-reliance’, and also provides a ‘net benefit for the Australian economy’. This is the acquisition ‘sweet spot’ where all three factors align and so should result in a straightforward decision. But Australian industry needs to be healthy and cost-effective to deliver such an outcome—a key focus of broader defence industry policy. 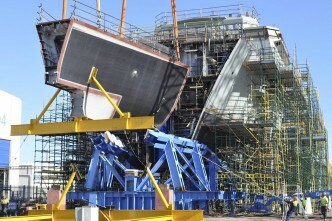 Regular maintenance and repair of Defence platforms is a useful example. 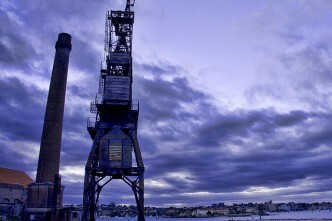 Doing that work in Australia is both physically necessary and more cost effective than transporting systems overseas. It also represents a good outcome for the Australian economy by employing Australian workers in high-skilled areas. Case B – a capability that provides ‘best bang for buck’ but not ‘needed for Defence self-reliance’ and not a ‘net benefit for the Australian economy’. Here, acquiring the capability overseas is the most cost-effective solution. Choosing the best solution from the world market provides the ADF with a wide range of options and avoids the costs and risks associated with being the ‘parent’ of a unique platform/system. One example is the acquisition of major military-off-the-shelf platforms such as the C-17 where there’s little direct benefit in acquisition for the Australian economy, but there are benefits from sustainment funds spent in Australia. Another example is the acquisition of the F-35 JSF where, although the majority of the acquisition funds are spent overseas, the global supply chain means that Australia benefits from firms such as Marand and Ferra delivering significant returns to the Australian economy. An effective industry policy would work to ensure maximum benefits to Australia even when buying from overseas, including through using Defence’s ‘buying power’ to open doors for cost-effective Australian defence companies. Outcome – buy from overseas supplier but ensure Australian industry is given the opportunity to provide necessary support and participate in global supply chain where cost effective. 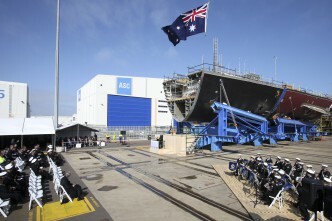 Case C –‘best bang for buck’ and ‘needed for Defence self-reliance’ but not a ‘net benefit for the Australian economy’. In this case an Australian company would provide the most cost-effective solution for Defence but overall—surprisingly—isn’t a net benefit to the economy. That probably means the company’s efforts have been diverted away from a more productive activity to satisfy the Defence need at a net cost to the economy. An example would be a truly unique Australian defence requirement that can only be provided in-country and that diverts funds/resources away from more productive activities. Arguably, supporting the F-111 at the end of its life fell into this category. Outcome – buy Australian but avoid the situation wherever possible. 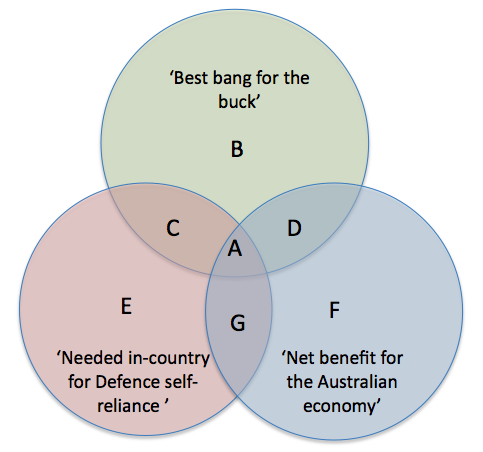 Case D – ‘best bang for buck’ and ‘net benefit for the Australian economy’ but not ‘needed for Defence self-reliance’. In this case, Australian industry offers at least a significant part of the most cost-effective solution even in competition with world’s best practice. Perhaps development and acquisition of the CEA CEAFAR radar falls into that category, although ongoing Defence support may be required to achieve a successful outcome. Outcome – buy Australian but beware the ‘long tail’ of through-life costs for an Australian unique product or service. Case E – ‘needed for Defence self-reliance’ but not ‘best bang for buck’ and not a ‘net benefit for the Australian economy’. Here a premium is paid to have the work done in Australia and while there’ll be some benefit to the Australian economy there’s no overall net benefit, i.e. the opportunity cost to satisfy the Defence requirement means the premium paid isn’t the best investment for the economy. A possible example may be the in-country provision of specialist fuels where in-country capabilities/resources are dedicated to meet low-demand Defence needs that could otherwise be doing more productive work. Outcome – buy Australian but continue to work to improve cost effectiveness of the Australian supplier and work to avoid Defence-unique needs . Case F – a capability that provides a ‘net benefit for the Australian economy’ but is not ‘needed for Defence self-reliance’ and does not represent the ‘best bang for buck’. In this case a premium is paid to have the work done in Australian even though it isn’t needed for self-reliance reasons. A careful assessment of the balance between the opportunity cost associated with paying a premium and the potential multiplier effects in the economy would be required to justify such action. For a $10 billion project, would the government pay a $10 million (0.1%) premium to have the work—or a significant part of it—done in Australia? What about $100 million (1%) or even a $1 billion (10%) premium? What if a State paid the premium? Consideration also needs to take into account that even though the capability itself might not need to be in-country, it may provide direct or indirect support for an industry capability that is needed for self- reliance. The ongoing discussion about whether an in-country shipbuilding capability is required to support essential ship repairs and upgrades highlights the issue. Outcome – buy Australian but only if a detailed economic assessment supports the net benefit argument. Case G – a capability that’s ‘needed for defence self-reliance’ and provides a ‘net benefit for the Australian economy’ but doesn’t represent ‘best bang for buck’. In this case, a premium needs to be paid for an in-country capability that meets self-reliance needs. That said, broader defence industry policy must address maximising the efficiency of Australian defence industry in those critical areas; for example, through training schemes and leveraging broader national investments in R&D to minimise the premium paid. A possible example here would be, for sovereignty reasons, paying a premium to employ an Australia-based company with Australian nationals to secure Defence information networks and sensitive Australian data. Outcome – buy Australian but continue to work to improve efficiency of Australian industry. This brief analysis highlights some of the key issues to be considered in developing a Defence acquisition/industry policy. The simple framework certainly doesn’t resolve the issues but does provide a structured basis on which to start to address them. 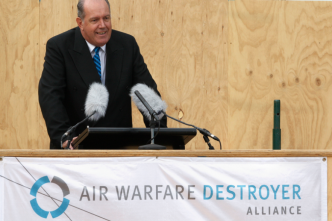 John Harvey is a former chief of Capability Development Group and former program manager of New Air Combat Capability Group. Image courtesy of Department of Defence. 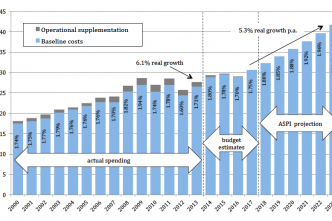 The 2014 Defence budget—as good as it gets!